This year we have all three decided to work on a Schwalm Whitework table center each. Schwalm white work or Hessen stickerei as it is know in Germany, where this lovely style of embroidery comes from is a form of both surface and counted embroidery. So far I have just mitred the corners, remembering to take lots of photos for the notes (not very interesting ones). I will post some of the work in progress as I go along. It seems like just yesterday that I wrote to say she was working on it for the Tour Downunder and here we are they are racing again next week. Hope the weather stays not to hot for them. If you have not looked at our web site lately, I have slowly been adding some colour cards. I have just finished Colour Streams, have added buttons and am in the middle of adding Mill Hill beads. I hope to this year finally finishing them all, but by saying so have perhaps just ill wished my self. Well here I am again finally, my but the last 6 months have just flown by. The last time I was taking pictures of the cyclamen in our garden just coming into bloom, I was going to post the photos to show you how they had inspired me, well maybe later. 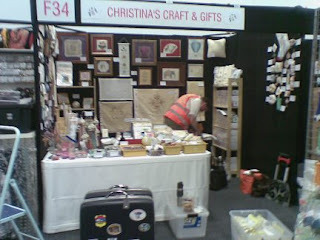 We then got very busy with our stand at the Adelaide Craft and Quilt fair, getting ready for it, deciding what to take, setting up and then putting everything back to more time than you would think. 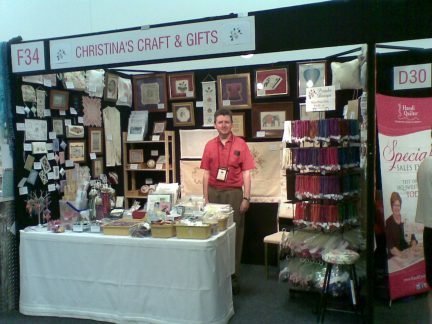 Gunter at the stand on the first day for the fair. Well we hope to get better at it as we will be going to the Melbourne Craft and Quilt fair in July, we hope to see you there. And if there is anything you would like to see on our stand either our kits or other threads, beads etc let us know and we will see what we can do.